An update has been made to the latest version of the Pokerstars Mac poker software. This time, it appears as if the software has been given some major cosmetic upgrades. The new software looks nearly identical to what a PC user would typically see. Here is a screen shot that I’ve taken from my BETA testing of the new software. 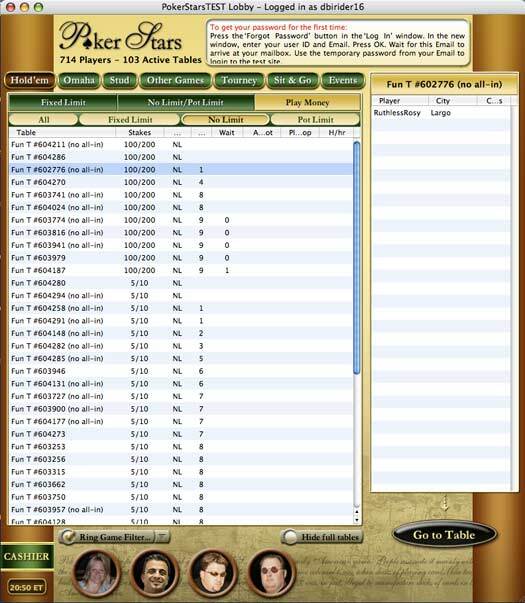 Although players are still unable to play poker for real money, the software is getting very close to being done. When I asked the BETA representative when the software is expected to be released I simply received a response stating that they will release a stable product and that major testing is being done before a full launch is made. All in all, I’m glad that Pokerstars has decided to perfect their Mac poker software before releasing it to the public. This should attract new players to Pokerstars and keep them there.